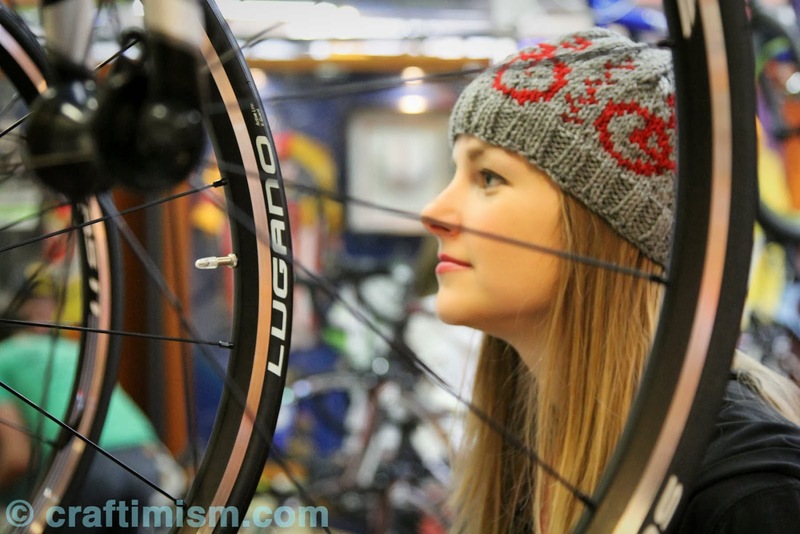 I am excited to share my Bicycle Patterned Knit Hat on the blog today! The pattern can be found here on Ravelry, here on Craftsy or purchased directly here. 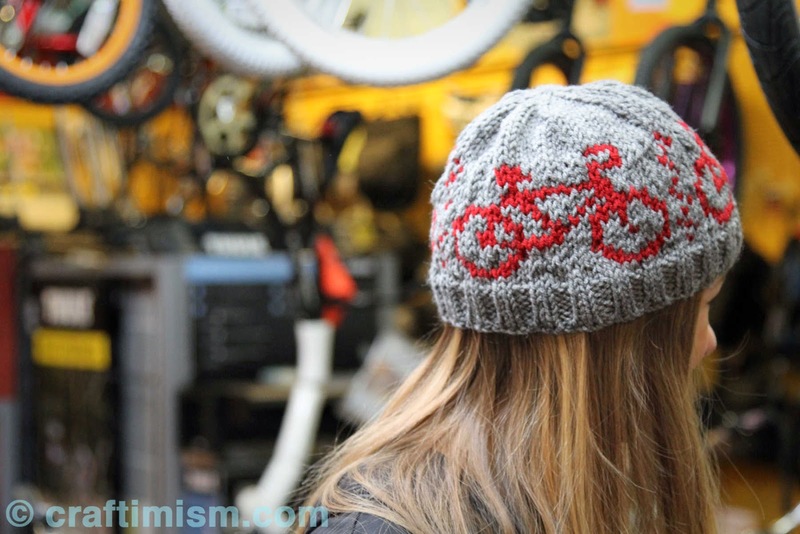 I made this hat for my friend Kyle who loves riding his bike. Kyle knows a lot about bikes and how to fix things (his real job is as an engineer) so when I found a bike abandoned in the basement of my apartment (see a post about my bike basket here), Kyle was nice enough to check it out and make sure it was safe to ride for me. When I asked Kyle if he would like any type of hat in particular, he told me to go ahead and design away! After consulting with his wife, I decided to make him a hat with a bike pattern. I really like how it turned out and I hope he does too! Special thanks to the Big Shark bike store for allowing us to take pictures. 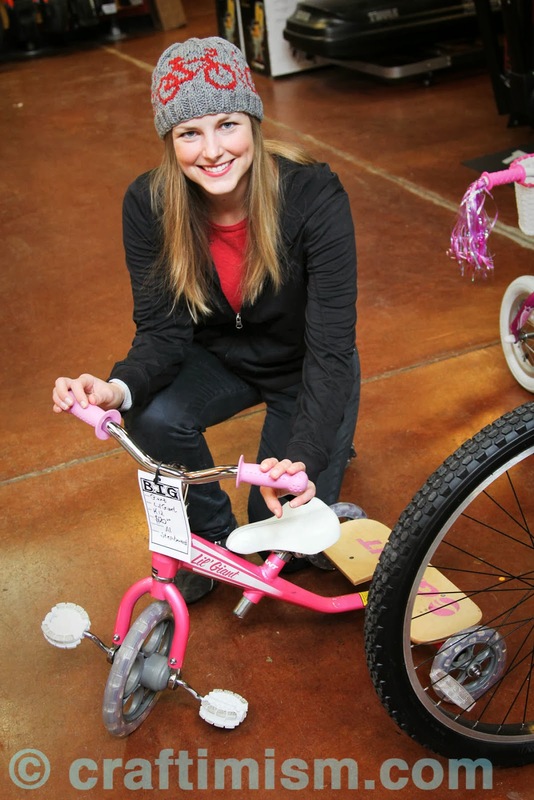 Hi Heidi- I purchased the pattern--and the bikes came out beautifully.! I did use size 5 needles-and my guage was correct and I used worseted wool. Only problem is the hat came out really small (would only fit small child). I knitted as instructed--the ribbing--the bikes--the additional knit rows and then the decreases...did I miss a step? Hi Kathy, I suspect this is that our gauges might have had different tensions and mine was likely stretchier than yours. I will revisit this pattern soon to double check. In the meantime, I would suggest going up several needle sizes. Good luck! Let me know how it turns out!